A former colleague recently asked me to come up with an outline of how to teach the Four Noble Truths to children ages 4 to 14. It was going to be part of a presentation at his Unitarian Universalist congregation. I did a quick search for some online material, but was surprised at how scant the resources were when it came to teaching kids about Buddhism. A monk once told me that in many Thai families, for example, the first thing parents teach their children is how to hold their hands when bowing. Then the parents move on to teaching the correct way to do the three bows before a Buddha image. Do they teach these prostrations and gestures because they are part of the rites and rituals of Buddhism? Not really. While that does play a part, doing the bows and holding your hands correctly takes concentration. It requires that you pay attention to what you are doing. And rather than teach a very young child something as esoteric as cause and effect, Thai parents teach their children how to concentrate so they can do something correctly. Concentration is, after all, one of the three legs of Buddhism: Concentration, morality, wisdom. I know there are others who despite their own Buddhist practice refuse to “indoctrinate” their children. Frankly, I find this attitude a bit self-serving. 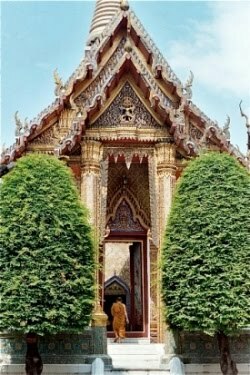 For most of us Buddhist converts, we came to Buddhism because we rejected our (most likely) Christian upbringing. The reason goes, I suppose, is that our children can “find” their own way just as we had. But this, to me, is a very flawed way of thinking. For example, let’s consider all the people who accepted their Christian upbringing and continue practicing a Christian faith. Likely they did so because as children, their parents made sure they attended church, probably attended religion classes also because to truly know one’s faith, one ought to study its texts. And these children participated in many Christian rituals, no doubt – everything from saying grace at the dinner table to participating in activities at the church where the family attended. The children accepted this and continued to hold on to their “religion” into adulthood. We converts were undoubtedly raised this way as well, but along the way we began to question the doctrines and the practices. Supplied with unsatisfactory answers, we sought something else. For many of us, it was Buddhism. Now, ask yourself this: would you have found Buddhism if initially you hadn’t felt satisfied with your Christian upbringing? If you hadn’t been exposed to Christian practices within your family, would you have likely searched for something else? Maybe, maybe not. The point I’m trying to make is that your childhood exposure to one religion prompted you to search for something else. However, let us not forget that a much larger group of people raised in similar circumstances found comfort and peace in the same religious practice as their parents and never developed a need to search elsewhere. Yet, for some Buddhist converts, there is this odd desire to deny their children this same opportunity. Why not teach your child about Buddhism? Why not “indoctrinate” them? Teach and let go. If they accept your guidance, then they will be happy. And if they are unsatisfied, they will search for something else, just as you had. And maybe they will join an evangelical Christian church and be happy. Isn’t that what we want for our children, for them to be happy? Some of you refuse to “force” your children to learn Buddhism and develop a practice because you don’t want to be like your parents who “forced” you to practice Christianity. But teaching your children Dhamma doesn’t need to be a “forced” activity. The Buddha used the very common image of a mirror to teach his son Rahula when the boy was just 8 how important reflecting on our actions is to our welfare. Paying attention to what we do is critical to our Buddhist practice. And there are many ways to teach that to our children without “forcing” a doctrine on them. If you teach your children the cause and effect relationship between their actions and the outcomes those actions create, then you’re teaching them Buddhism. One of the Five Recollections is: I am the owner of my kamma, born of my kamma, made of my kamma, related to my kamma, abide supported in my kamma…” Being related to your kamma is literally just that: your children are representations of the fruits of your kamma. They’re your children for a reason. Contemplate that during your next meditation session and see what bubbles up in your mind. Anyway, below is what I came up with after finding this site. It’s very basic, but it’s a start. Feedback is welcomed. 1. We aren’t happy all the time; there are times when we are sad, angry, frightened, or lonely. 2. We feel sad, angry, frightened or lonely mostly because we can’t get what we want, or we’re told to do something we don’t want to. 3. It’s our fault that we feel this way, and we can stop it when we learn how to want the right things. 4. The Buddha gave us Eight things to remember to help us learn how to want the right things and accept that life doesn’t always go the way we want it to. The Buddha’s Noble Eightfold Path essentially tells us there are right ways to do things and wrong ways. Doing the right thing is much more than being moral. Doing the right thing brings us a happiness that causes us to feel at ease, unworried and unafraid of what may happen next. It’s a happiness that doesn’t go away. The Buddha compared this type of happiness to a person’s shadow: it’s always following you but you can’t tell it’s there unless you look at it. Doing things the wrong way is what brings us those feelings we don’t like. If we say mean things, we’re going to make someone else angry, and what do most people do to someone who has made them angry? They get even, they do something to harm the other person. So it starts with us. We create our unhappiness, and this can cause us to feel hopeless, like we’re stuck dragging a heavy weight all the time. The Buddha described how our wrong actions create burdens by using a simile of an ox dragging a cart. The cart is heavy and burdensome. It’s as if with each wrong action we take, we are tossing another heavy rock into a wagon we are tugging along behind us. If we’d just stop putting heavy rocks in the wagon, it would be easier to pull. Excellent! I have written plenty about this, and can't figure out what else to say to those claiming they don't want to indoctrinate their kids. That whole post Karen Miller wrote awhile back about not teaching kids is a great example. She writes that kids are naturally more in touch with their buddhanature (a romantic notion in my view), and then proceeds to say the only way to raise her children well is to focus on her own practice. There's a whole section warning about "all forms of ideological indoctrination," which I have seen repeated by several others either responding to her post, posts I have made, or in other posts. The same people seem to have zero issue submitting their kids to a public or private school system, to organized sports and clubs, to sitting in front of the TV, and other activities where "indoctrination" certainly can and often does appear. I think the older I get, the more I realize that the more young folks that can tap into their deeper "selves," act decent with others, and exhibit some control in difficult situations, the better. It seems quite foolish to me to worry so much about indoctrination when everywhere you turn, there are teens and young adults getting killed, killing themselves, killing others, getting hooked on drugs, robbing banks, having babies at 16, believing that life is mostly about making money and having piles of stuff, etc. Not that Buddhist practice will rid the world of all that, but perhaps it can lessen it. In fact, I'm sure it has lessened it amongst the kids that have gone through our sangha's programs. I hear ya Nathan! And it's not "the older I get," it's that you're getting wiser ;-) Wisdom comes through investigation, not merely the result of age. Thanks so much for your rant! I wish continued success for you with your sangha's programs. Great post! I get really frustrated with parents who hide out in various myths about not indoctrinating kids just because parenting has to be one of the toughest, deepest practices in not knowing. Face it, we're all indoctrinated - or at lest we tend to be blind to our indoctrinated nature. Kids need structure and guidance and that is not the same as brainwashing them. In fact, as parents who are Buddhists it's about skillful means and the path that is useful, beneficial and delivered with respect for the child's readiness to receive the teaching - as you point out well in your post. The Third Mindfulness Training (Freedom of Thought) of Thich Nhat Hanh's Order of lay practitioners admonishes against imposing one's views on others - even our children. It continually astonishes me that parents agonise over "violating" this precept when they have had to take a stand with their children. Me, I'd rather have burned in Buddha Hell than not to have set clear firm rules for my child. Thanks Genju! I totally agree with you. Imposing limits is not the same as imposing views. One says "this action is unacceptable and must stop," and the other says, "you should think this way and be like me if you want my affection." The first is done with love, the latter is driven by pure ego. @Genju, really? I'll have to Google that monastery and see if there are any pics of that Buddha. "It’s our fault that we feel this way, and we can stop it when we learn how to want the right things." Kids (and mine in particular, and ME as well) are highly self-critical. I honestly don't know how to reword this but would concentrate on the power 'to stop it when we learn to want the right things.' The concept of 'the right things' I find wonderful and will bring that up with B today (our daughter). Interesting point. I see what you're saying. So perhaps instead of saying our unhappiness is our own fault - which it is, because it is our faults or flaws in our actions that cause it - it might be better to present it as "we create these feelings ourselves by wanting the wrong things, and we can stop doing this by learning how to want the right things." I can go with that. What do you think? How about something a la "We are not our thoughts but we are responsible for them"? So, "We are responsible for how we react to people and events and it is within our power to make wise, kind, healthy choices." Additionally, I wonder if it's more effective to teach children the three groupings for the N8FP, ethics, meditation, and wisdom, rather than all 8. That's an interesting supposition an worth exploring and experimenting. But my intent here was just to provide a basis for others to use. The beauty of Buddhism is it is testable. This is true, our religion practices will stick to us if we are being brought up in the right community, given with the correct knowledge that we all pursue. This is such an awesome find for me, I gave up my Christian religion as I grew older and questioned many things in the Bible. I have since then found Buddhism and have tried to find ways in which it would be simple to teach my children. Thanks for sharing this excellent blog about concentration excercises. Keep blogging! "These four things, monks, I have taught you..."